Kochi, 04th November 2018: Zee Keralam, the newly announced Malayalam General Entertainment channel by Zee Entertainment Enterprises Limited (ZEEL) held a grand event, Vismayaraavu as a pre-cursor to the channel launch, at the Adlux Convention Centre, Kochi yesterday. Vismayaraavu is a tribute to the people of Kerala, celebrating the spirit of every true Malayali, thereby marking the beginning of Zee Keralam. The event witnessed several dignitaries including the Guest of Honour, Shri. Justice (Retd.) P. Sathasivam, Honourable Governor of Kerala, Shri. A.K Balan, Honourable Minister for Cultural Affairs and Dr. M.K. Muneer MLA, Deputy Opposition Leader, along with members from the ZEEL and Zee Keralam family. Top celebrities from Mollywood, Bollywood, Kollywood and Tollywood including Mammootty, Jayaram, Madhuri Dixit, Karthi and Rana Dagubatti amplified the entertainment quotient with their performances while introducing some of Zee Keralam’s tentpole fiction and non-fiction shows. 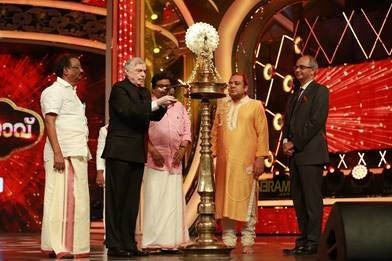 An evening filled with glitz, glamour, music and entertainment, leading celebrities from the Malayalam Entertainment Industry walked the red carpet and extended their support towards Zee Keralam, which is set to storm the Malayalam Television Industry. The extravaganza of Vismayaraavu was brought together by the scintillating presence of leading stars of the Indian Entertainment Industry including Madhuri Dixit, Rana Daggubati and Karthi that left audiences in awe of their favourite stars. Closer to home, the event also witnessed the magnificent talent of the Mollywood including Mammootty, Priyamani, Jayaram, Jude Antony, Manju Warrier, KPAC Lalita and Jai Kumar Nair. The star performers of the evening included the unveil of the channel brand anthem by Music Director and Playback Singer Alphons Joseph, a stellar musical performance by Musician Stephen Devassy and Singers Anu Sithara. Entertaining performances by Miya, Wamiqqa Gabi and Illusionist Raj Kalesh apart from home-grown Malayali talent – Vyshnav, Yumna and Siddharth who captured the hearts of music lovers across the country on Sa Re Ga Ma Pa (Zee TV). Zee Keralam’s channel partners include Chungath Jewellery, Fogg Perfume Body Spray, Kansai Nerolac Paints Pvt Ltd and 7UP. Zee Keralam’s Vismayaraavu is co-powered by Anna Kitex Group, Eyetex Dazller Luminous Liquid Make Up and Santoor and, Special Partner – Amco Paints. Zee Keralam is the Malayalam General Entertainment Channel of Zee Entertainment Enterprises Ltd (ZEEL). Launching on November 2018, Zee Keralam is set to offer a wide variety of shows that cater to the unique entertainment preferences of Malayalam audiences around the world. With a strong line-up of original content including fiction shows like Adutha Bellodu Koodi, Kuttikurumban, Chembarathi, Swathi Nakshatram Chothi and Alliyambal and non-fiction shows like Dance Kerala Dance, Super Bumper, Tamasha Bazaar and Good Morning Keralam to name a few, Zee Keralam is set to present a strong line-up of novel and innovative content that is family inclusive and culturally rooted within the diversity of Kerala. With the brand promise, “Neithedukkaam Jeevitha Vismayangal” translating to “Let’s weave wonders in life”, the channel aims to stand for progressive content that will bring together generations through endearing stories of ordinary people challenging circumstance and crafting extraordinary destiny. Zee Keralam will be well-connected across all cable, DTH and digital platforms. The channel will also available on ZEEL’s digital and mobile entertainment platform, Zee5.